Our Facebook page is up and running. Become a fan here. Subscribe to our corporate blog for product updates, email tips and more. Fred uses Gmail, but the general techniques he uses to keep on top of email can be used by anyone. At ClearContext we’ve found techniques like these to be key parts in a successful email workflow process, and the MS Outlook team recently posted some similar thoughts on email best practices. Here’s how ClearContext automates and enhances key pieces of these techniques to let Microsoft Outlook users take advantage of Outlook the way Fred uses Gmail – and get through the email even faster! ClearContext highlights messages from known senders and VIP senders. This lets you easily scan through all your unsolicited messages and quickly get rid of all your unwanted/unimportant email. Features like AutoAssign and Unsubscribe automatically move all emails from specific senders or threads out of your inbox. This is another place ClearContext shines. It automatically analyzes your email activity to highlight email from your most important contacts, so you can easily pick them out of the mass of email. We’ve already built that for Outlook users by not only highlighting email from the most important people in your life, but also providing optional views that can move those messages to the top of your inbox! We agree. The File Original Message” feature in ClearContext lets you automatically move messages out of your inbox once you reply to them. In ClearContext we provide two ways to take advantage of conversation threading (and other features slowly inching their way into Outlook). First, we provide a threaded view that groups messages in a conversation together in your inbox. Additionally, MessageContext adds an expandable pane to each email to display other messages in the thread. However, I’m sure he does use a calendar. 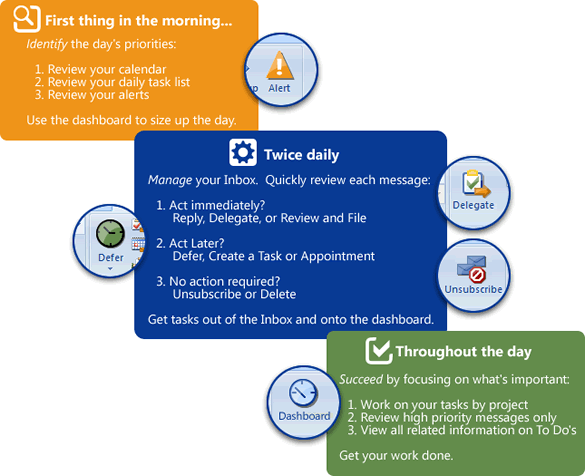 For both of those things, one-click task and schedule buttons convert emails into to-do items and calendar entries. The emails can be moved out of your inbox, while still maintaining a link from your to-do list or appointments to the original email thread. ClearContext is committed to making email better for people. It’s great to see people like Fred and the MS Outlook team contributing their thoughts on one of the biggest issues facing just about everyone in business today. 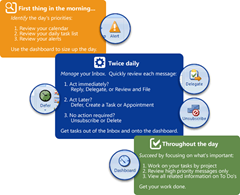 With ClearContext v5 we’re making it easier than ever for Outlook users to take back control of their email. We hope you’ll give it a try. Thanks again to Fred and the many other bloggers who are sharing their email management techniques! We’ll continue to highlight the best posts and practices on this blog. Posted by deva at 5:35 pm on November 29th, 2009. Melissa MacBeth has published an excellent collection of articles on “the right way to use Outlook.” If you’re interested in sharpening the pencil, review these tips and pick the ones that work best for you. ClearContext v5 Beta – What’s New? ClearContext v5 is currently in beta testing, with final release coming soon. This release makes ClearContext’s email management features faster, more automated, and more intuitive so it’s even easier for users to stay in control of their inbox. Here are some of the key differences you’ll find between ClearContext v4 and v5.0. One of the biggest changes in v5 is an intelligent one-click filing system and project selector. The File Msg button on the toolbar now displays either the name of the project folder assigned to this conversation or a smart one-click filing suggestion (indicated by a question mark ) for new conversation threads. Open the project selector ( ) for additional filing suggestions or to quickly search for any folder across all your mail files. In place of ClearContext’s old inbox views, v5 uses categories to indicate important messages. ClearContext marks messages from your important contacts as “CC-VIP” and messages in threads you’ve participated in or from contacts you know as “CC-OK.” Customize category name and color in options or configure ClearContext to mark important messages with flags or Outlook priority. This lets you quickly scan and identify your most important messages. We’ve also provided three optional color-coded views using these priority indicator categories. Many of our customers run Outlook on multiple PCs. ClearContext v5 includes support to run ClearContext on each of those machines, keeping track of filing and prioritization information across them all. v5 also provides preliminary support for Outlook 2010 (Technical Preview – x86 only). 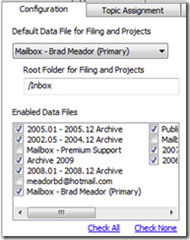 Additionally, ClearContext v5 now provides filing support to unlimited Outlook mail files. A few v4 features no longer exist in v5.0. FolderContext has been removed, as most pro users prefer to use Project Dashboards to view that information. FolderContext will be redesigned for the v5.1 release. Alerts and custom Notification Managers have also been removed in v5.0. Those two features will be redesigned for v5.2. v5.0 is just the beginning of the next generation of ClearContext. Our v5.0 release focuses on streamlining inbox management. Version 5.1 is dedicated to improving project management and dashboard capabilities. And 5.2 will focus on improvements to AutoAssign and related features. See our blog for the v5 product roadmap. We hope the new features in ClearContext v5 make it an even more useful and seamless part of improving your Outlook and email experience. To preview v5, download the beta test version here. Post all feedback and issues in the beta section of our User Forums. All v4 purchases made after August 1, 2009 and all ClearContext Connect subscribers will receive a complimentary upgrade to v5. This upgrade is available for all ClearContext customers, including the TWC/MYN powered edition of ClearContext Pro.